You may have noticed in some recent videos on my YouTube channel that I’ve been trying to find a way of measuring the stiffness of squash rackets. The app mentioned in the video is called RacquetTune. I used it on an iPhone. Thanks to Tjeerd for the tip on this app. I actually bought the “Racquet Testing” bundle and RacquetTune came with it. It looks like you can buy the RacquetTune app separately for a dollar less. Anyhoo, feel free to give this app a try or shoot holes in the method! Couple of interesting food-for-thought comments on the YouTube video. Hi Pierre, I’m totally with you regarding an objective measurement for stiffness! However, watching your video I noticed several possible pitfalls or at least factors that might influence your interpretation of the results. 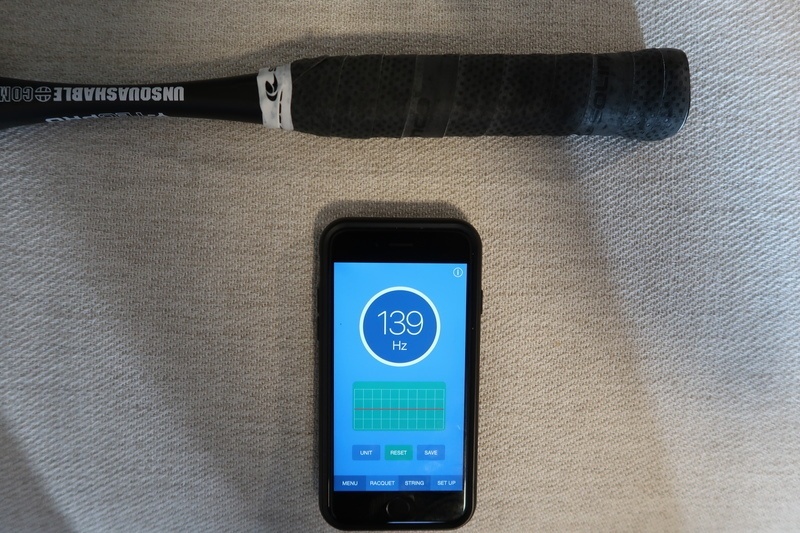 Although I don’t have the RacquetTune app myself or are otherwise affiliated with it, it’s pretty clear that it uses sound (pitch) to produce some stiffness/tension number. So, what you need to take into account are the following: 1. The thing you hit the racket with. You use a hollow PVC pipe. 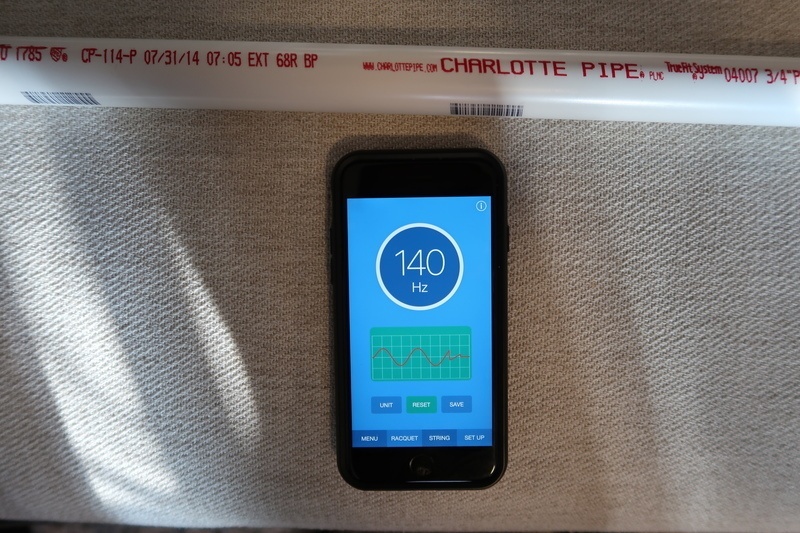 Especially since it’s hollow, the pipe itself will prodoce some sound of specific frequency/frequencies. If you’d use a different thing to hit your racket with, you’ll get different results. Try it. 2. The way you hold your racket. In this video you held it softly near the grip/throat of the racket. If you hold it softly (which you did), you’ll allow more of the pipe’s kinetic energy to transfer to kinetic energy of the racket in total, rather than vibrating the molecules of the racket. Or in other words, the softer your grip on the racket as you hit, the more it will swing in some direction and the less it will vibrate. It’s the vibration of the racket that in turn vibrates the molecules in the air, which is the sound the app is interested in. 3. Stringing tension should play a role. 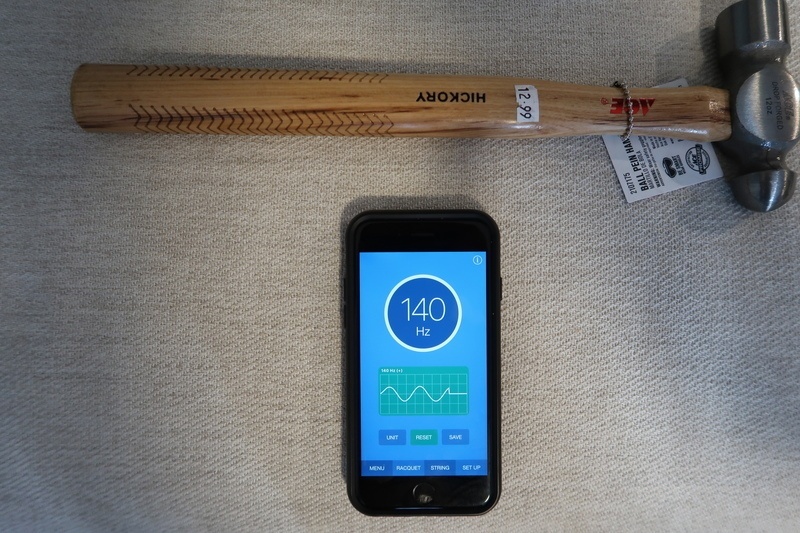 Probably mostly due to vibration of the strings themself as you hit the racket, adding to pitch that the app measures. Other things like the material of the frame might also play a role, but then again, the material would also play a role in the stiffness. So it’s hard to say whether that needs disentangling. Anyway, the way you use the app now, does probably not lead to an objective outcome. But it could be effectively used in comparison. If you hit each racket exactly the same with the same material, you might be able to say: “this racket’s stiffer than that one”. 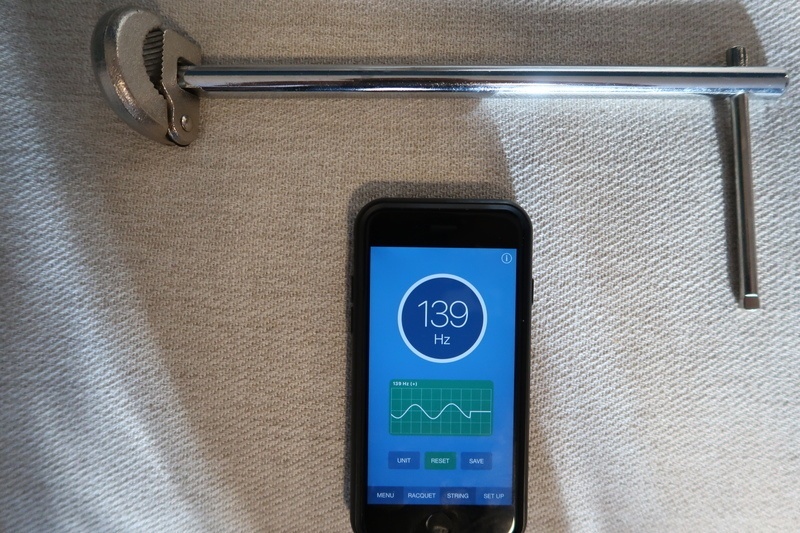 Hi Pierre, nice idea to use the frequency method to deduce stiffness for squash rackets! However, when using frequency as your method you must also take into account the weight of the racket. A higher weight will produce a lower frequency and a lower weight produces a higher frequency. This means that two rackets that do have the same stiffness, but differ in weight, will produce different results. 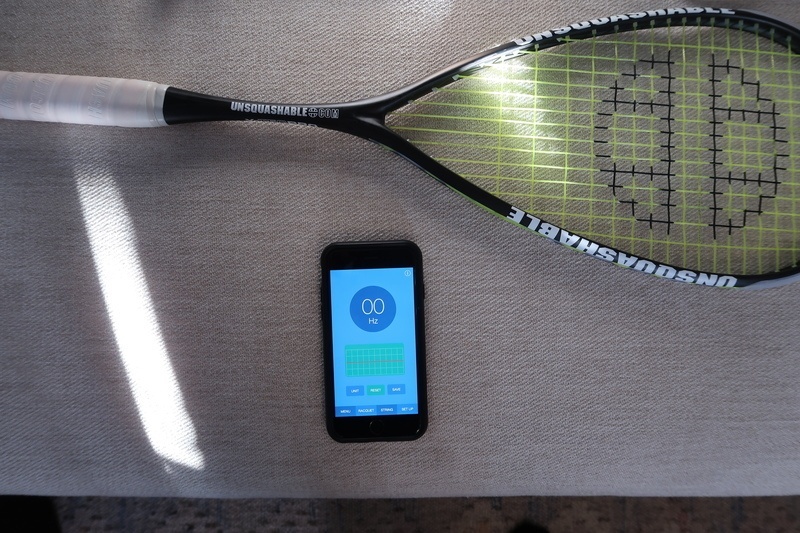 To get more accurate measurements you should multiply your measured frequency with the racket weight. That will give you comparable results from this method. This give us a baseline stiffness reading of 140 Hertz. Next up, this metal tool. I have no idea what this tool is used for. Some sort of pipe wrench? I found it in my basement. Result: about the same, 139 Hz. That’s less than 1% difference from the baseline. Result: about the same, 139 Hz. 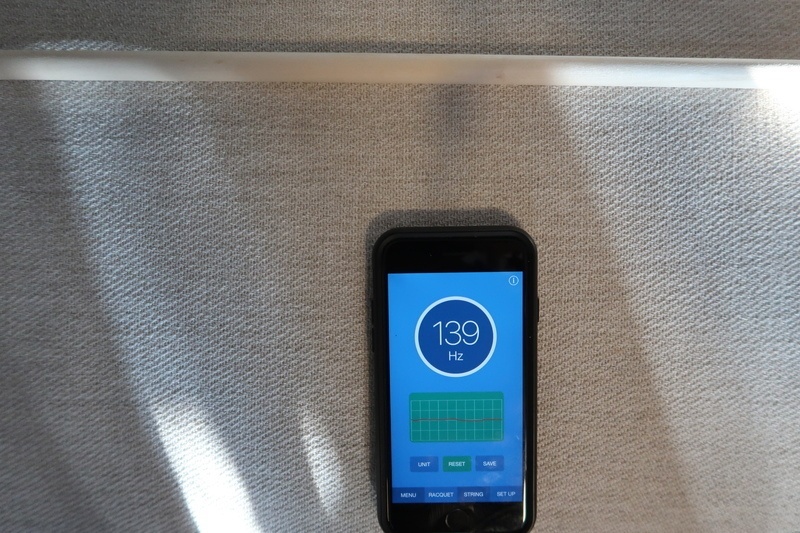 Next, I measured the stiffness by hitting the racket with another racket. SO META. How about adding an overgrip? How about one of those little shock absorbers like the kind that come on Dunlop rackets? HANG ON HOUSTON, we have a new development here: 136 Hz. This is a little over 2% lower than the original reading. Honestly, I’m not even sure I understand this. Adding a shock absorber makes the racket feel less stiff? I am a badminton player. I use similar method to evaluate racket stiffness. Tools are little different. As I understand this, the racket is just some flat spring having some mass and inertia thus having some mechanical resonanse. What my wrist likes is not the actual force I need to apply to bend the racket. 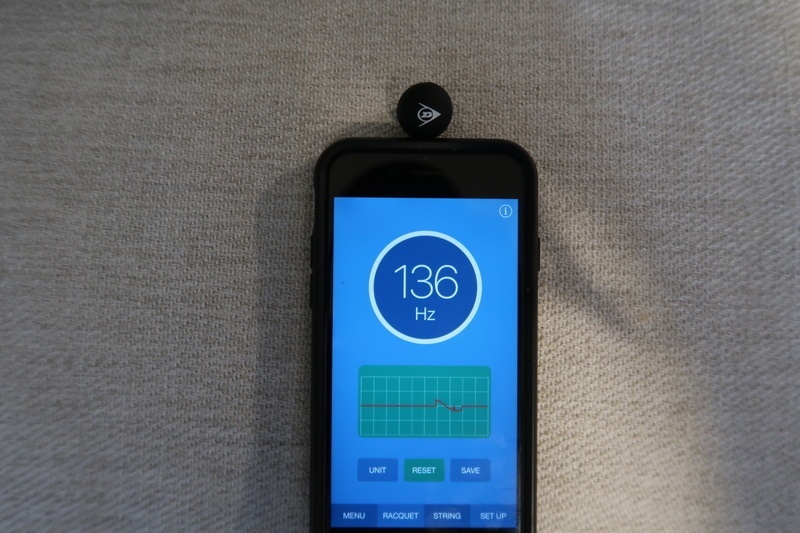 It is a resonant frequency which responds to wrist quickness. Heavier racket may be more rigid and still have the same frequency as lighter and more flexible one as rigidity and mass go along (resonant freqency equals mass/spring factor). I simply press the grip to the table, put a smartphone on this grip and wack the end of the head. I use some Android app called Accelerometer which draws a graph of FFT transform. My favourite racket shows more or less 15Hz. I would describe my racket as being on heavy side (95 g ready to action), it has a 295 mm balance (slighty HH), stiffness 3-3,5 out of 5 (called “extra stiff” by the manufacturer but it is not). I suppose You need some hefty clamp and bigger table to use my method on squash racket. You can still use audio frequency meter. I’m trying to learn a little bit more about squash racket and I found a new concept here that you call stiffness. Different of weight, balance and shape, I didn’t understand how stiffness works in my game. I read some articles about stiffness on tennis racket and there the want to know how flexible is a racket, I think the idea is different here. Could you explain what is the exact idea? Hi Fernando, I was trying to measure how flexible each racket is. 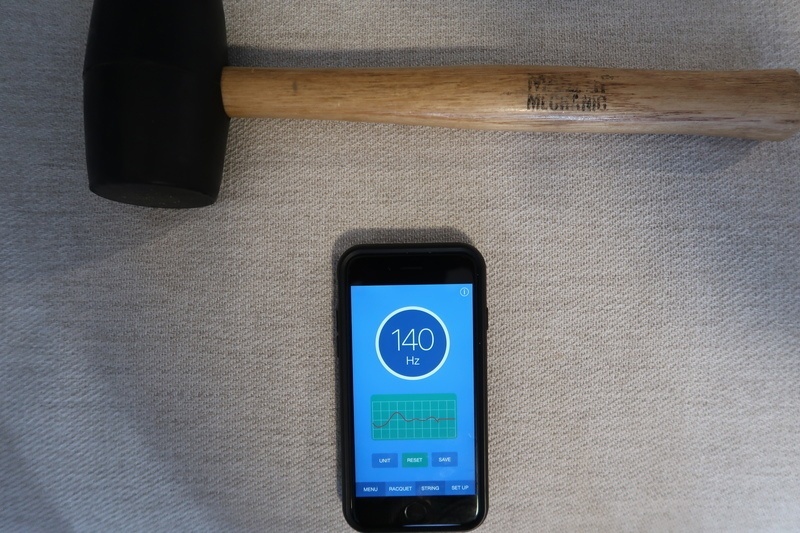 I was using an iPhone app to measure. Over time I have started to think the string tension has too much effect on the stiffness reading, and therefore I am not sure my method works. Maybe it would work if I removed the strings from all the rackets before I test them, but this is not practical for my purposes. I will check how they provide this measure. 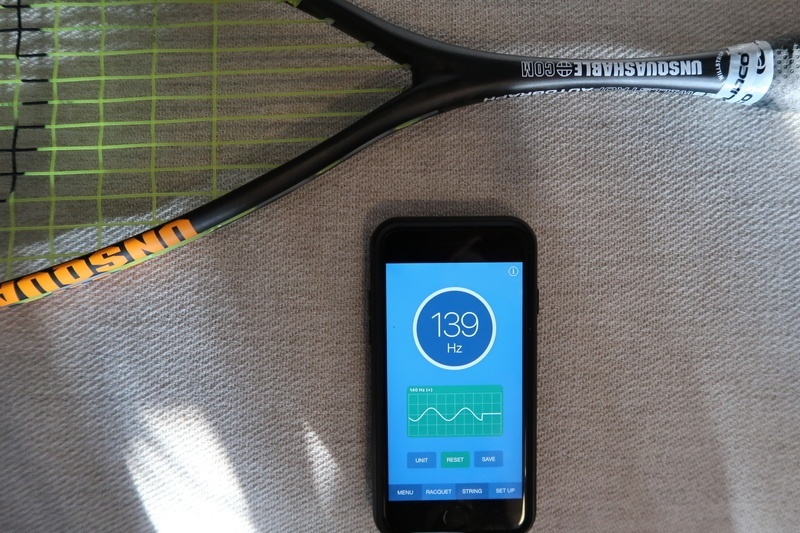 There is an option in RacquetTune to measure the frequency (stiffness) of the racket frame, but I think the result might be contaminated if the racket is already strung. I heard about a Babolat RDC but I never saw the video. Very cool, thanks for sharing! It’s interesting. 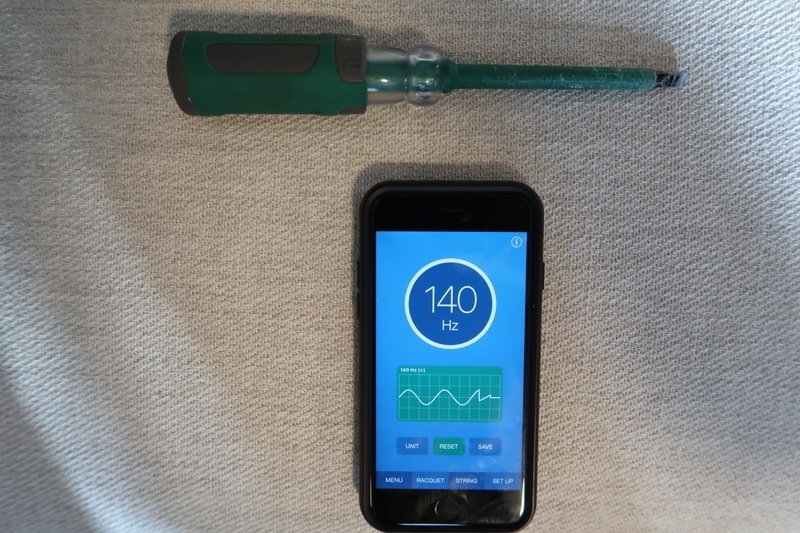 Perhaps compare contrast with a vibration dampener to see if that impacts your readings. Also compare to a piece of weighted tap on top of frame. Love the OCD and effort. Thanks Brent I will try those ideas!